We live on a unique, indescribably beautiful planet that faces threats from many sources. Drought, global warming, sea levels rising, and human interference all play a role in the gradual disappearance of so many of Earth’s natural wonders. 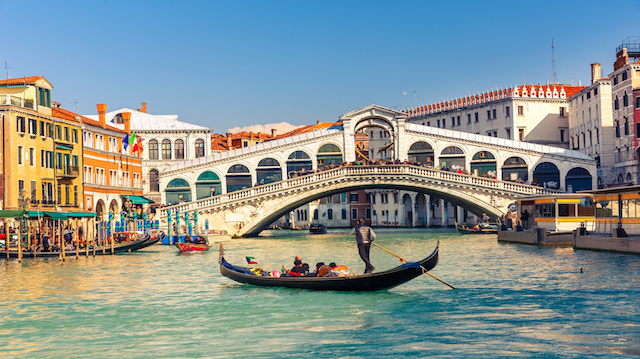 Venice may evoke scenes of romantic gondola rides in the moonlight, but the future of this historic city is quite bleak. Scientists are now questioning the life span of Venice. While the city’s foundations have always been a bit precarious, a recent increase in severe floods has caused many of its old buildings to subside. Venice is sinking — now even more so than ever. Experts say the “floating city” may be uninhabitable by the end of the century. Holding the titles of largest coral reef in the world and the largest structure made by living organisms, the Great Barrier Reef is not only visible from space, but it is also one of the most popular diving attractions on Earth. But the reef is more than just a tourist attraction for adventurous divers. It is home to over 1,500 fish species and numerous whale, dolphin and porpoise species, among countless other plants and animals. Sadly this beautiful, organic creation is being eroded by human pollution, overfishing and rising temperatures. This gorgeous natural wonder that spans more than 133,000 miles of ocean took 7,000 years to grow. Shouldn’t we take the opportunity to appreciate and explore the reef before it’s too late? Remember to be a good steward when visiting the reef — the coral is very delicate and easily damaged. The Dead Sea is a salty, mineral-rich lake famous for its historical significance and supposed healing properties. The lake’s salinity is 10 times higher than the ocean and at 1,300 feet below sea level, it is the lowest point in the world. When neighboring countries began drawing water from the Dead Sea’s main tributary, the River Jordan, the lake began to dry up. In the past 50 years, this “buoyant” body of water has sunk about three feet per year. This is a real problem, and experts estimate that at the present rate of decline, the lake will dry up completely in the next 50 years. South America is home to the largest tropical rainforest, the Amazon. This biodiverse rainforest is the only place in the world to find many unusual animals and plants. Climate change is the chief predator of this tropical expanse. A 2009 study discovered that a global temperature rise of 3.6 degrees Fahrenheit would cause 20 to 40 percent of the rainforest to die off in the next century. Even more destructive, a rise of 7.2 degrees Fahrenheit would destroy 85 percent of the rainforest’s unique habitat. This breathtakingly beautiful national park spans more than one million acres of lush land and is home to many different species of wildlife. As the name suggests, Glacier National Park once consisted of hundreds of stunning glaciers. Rapid climate change has brought about the melting of all but a few. In 2010, only 25 glaciers remained in the Montana park. If global temperatures continue to rise at the current rate, over the next 15 years even the last 25 glaciers will disappear. Their disappearance will not only take away from the beauty of the national park, but it will also greatly disrupt the park’s delicate ecosystem. This stunning island nation is located in the Indian Ocean southwest of India and Sri Lanka. The country, a collection of 1,192 small islands is home to over 393,500 people and a booming tourist industry. It is officially the lowest lying country on Earth. The islands’ average elevation is 5–8 feet above sea level. While this low elevation provides for beautiful beaches, rising sea levels present a very serious danger to the country. It will be completely engulfed by water in the next 100 years if the ocean continues to rise at its current rapid rate. Concerned by this risk, the Maldivian government has taken precautionary measures by purchasing land in other countries for citizens who may be forced to leave their lovely island homes. Alaska is one of America’s most gorgeous states, with the Alaskan tundra being the most distinguished feature of this northern state’s landscape. Lately, climate change has increased the thawing of its permafrost, which greatly changes the intricate ecosystem and damages the general infrastructure of the tundra. While some of these natural wonders are changing and disappearing through no fault of humanity, most are being threatened by increases in population and humankind’s insatiable need to explore and expand. Greenhouse gases and harmful pollution are slowly but surely heating up our planet. So the question is, what can we do about it? Consider your carbon footprint. What effect are you having on the planet? All change starts on a personal level. Are you treading lightly, always considering the most energy-efficient ways of travel and living? Or are you stomping through this world like Bigfoot, determined to leave your mark on the Earth? If you answered yes to the latter, then you need to take some time and seriously consider the harmful effect that your negligence is having on this delicate, intricately balanced, pale-blue planet. Previous articleHillary Clinton and GMOs: What Is Her Policy? Hey Buddy!, I found this information for you: "Top 7 Places to Visit on Earth… Before It Is Too Late". Here is the website link: https://www.thealternativedaily.com/places-to-visit-before-it-is-too-late/. Thank you.